This looseleaf manual provides a wealth of information on an industry that, until recently, was highly secretive. Unlike traditional market reports, it examines every aspect of the industry from exploration, mining and extraction through to production methods, applications, pricing and trading. The metals and their history; Mineral deposits; Extraction methods; Metal production; Metal demand and applications; Platinum group metal pricing; Platinum group metal trading; Derivatives; Future prospects. 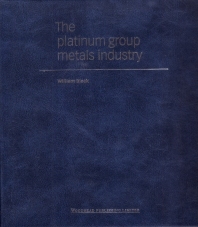 William Black has many years experience of the precious metals industry. From 1988 to 1997 he worked for Impala Platinum in South Africa on a number of projects, including the development and commissioning of extraction processes. He was also the manager of a joint venture between Impala Platinum and a technology company from the United States. In 1997 he was appointed to set up a gold mining agency for the government of the United Republic of Tanzania of which he was subsequently appointed director. He now consults on various projects in the mining industry. William Black has an MBA from the University of Witwatersrand.